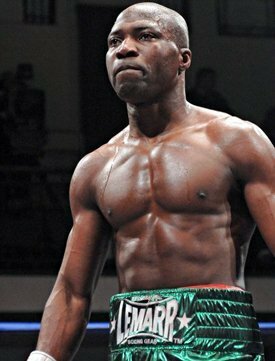 Exclusive Interview by Geoffrey Ciani – I was recently afforded an opportunity to speak with undefeated junior welterweight contender Ajose Olusegun (30-0, 14 KOs) who is scheduled to face Lucas Matthysse (31-2, 29 KOs) on Saturday night for the interim WBC championship. The 32 year old Olusegun has been the WBC mandatory for a number of years now, but has been consistently overlooked when it came to getting his opportunity—until now. Olusegun spoke about his upcoming fight, and also shared his opinion on the October 20 rematch between Erik Morales and Danny Garcia. Here is what Olusegun had to say. GEOFFREY CIANI: Hello everyone. This is Geoffrey Ciani from East Side Boxing and I am joined here today by junior welterweight contender, Ajose Olusegun. How is everything going today, Ajose? AJOSE OLUSEGUN: Yeah everything is alright. Thank you. I’m doing well. CIANI: Good, good to hear. Now you have a big fight coming up this Saturday against Lucas Matthysse. How has training and preparations gone for this fight? OLUSEGUN: Training and preparations have gone well. It’s gone the way I wanted it to go. I did some preparation in New York, I did some in Nigeria, and I did some in Vegas. So training has been okay and the preparation has been perfect. CIANI: Great. Now Ajose, you’ve been the WBC mandatory for over three years, and during that time seven other guys have gotten to fight for the title. This is for the WBC interim title. How do you feel about all of the circumstances and the long wait you’ve had to go through? OLUSEGUN: Obviously I’m not happy about it, because I believe if you deserve a shot you should get it regardless of where you are from. You know this is what we call a “world title”. It’s a world title we’re talking about, so wherever you’re from if they’ve decided you’re the mandatory challenger you should get your shot! They want to play politics. However, that is behind me. I’ve got a fight right now. I got Lucas Matthysse in front of me and I got to deal with him right now. CIANI: Let’s talk about Lucas Matthysse for a moment. You’re squaring off against him. He’s been a hot item where he’s been on the short side of some close decisions against Zab Judah and Devon Alexander. What do you think of him as a fighter? OLUSEGUN: I think he’s a good fighter. Yeah, I think he’s very good at what he does. However, I think I’m better than him. He’s never fought an opponent like me, so this is a different experience for him entirely. I can’t wait to get in the ring against him. It’s going to be a good fight. I’m very sure of it. CIANI: What did you think of his last fight when he beat Humberto Soto? OLUSEGUN: I didn’t see that fight. I’m not interested in seeing it. CIANI: Okay. Now your last fight was in September of last year. Do you expect that you will have any ring rust going into this fight after a pretty long layoff there? OLUSEGUN: I don’t think so. I don’t think so because I’ve stayed in the gym. I think come fight night I think I’ll be ready. Obviously I would like to be fighting regularly, but no excuses. I’ve got my opportunity. I got to grab it. I’m really prepared and I’m ready for the fight. CIANI: Ajose, how would you evaluate your last fight when you beat Ali Chebah by unanimous decision? OLUSEGUN: I think that was a good fight, too. Ali Chebah, too, you know he came to fight. He’s a good fighter, too. This was a guy who had never been stopped, and Chebah never really lost a fight. The only loss on his record was a robbery in Mexico. He was a good fighter. He is still a good fighter. I think that was a pretty good performance on my part, and Ali Chebah too, he gave a good account of himself. CIANI: Now next month Erik Morales is having a rematch with Danny Garcia. Do you think that we’ll see anything different this time around when they fight again? OLUSEGUN: I don’t know. I don’t know. Honestly it’s a ridiculous match. Let’s face it! Erik Morales is a legend. I have a lot of respect for him, but the first time he was the champion and he came in overweight. Now this is something my daughter was talking about. He didn’t just come in overweight, he came in unprepared. This is a champion we’re talking about! It’s his title defense, and he came in flabby. He came in fat. You don’t see a fat light welterweight. No, you don’t see that. So obviously there is something going on. I don’t know. I don’t want to say anything, but listen, there was something going on there. So he came in, he fought, and he lost—and now he’s getting a rematch! This is ridiculous! You know this is ridiculous. So right now I don’t want to worry about anything with Danny Garcia or Erik Morales, I’ve got a better fight with this guy in front of me right now. I’ve got a bigger fish to fry, so I got to concentrate on this fight, get it over with, and get my victory and get my belt. CIANI: Now with the cancelation of the fight between Alexander and Bradley, your fight has been elevated to the main event. How do you feel about having this opportunity to showcase your talents here on the big stage like this? OLUSEGUN: Well actually, I’m really glad that Showtime gave me the opportunity to showcase my talents on their network. You know initially I was the co-main event. For me nothing else changed because I’m still fighting the same fighter. So nothing else changed. I’m just glad that I’m fighting on Showtime. That’s it! CIANI: Do you have any added pressure? You’ve been waiting for a long time for an opportunity like this. Does it give you any added pressure that you’ve had to wait so long, and now here it is, right in front of you? OLUSEGUN: No. No added pressure. I’ll deal with the pressure when I’m getting in the ring. You know I got to go there and win and make sure I win well, and that’s it. There’s no added pressure because I’ve been waiting for this opportunity. Whether I got this opportunity two years ago or now, it’s the same opportunity. I just have to make sure I grab it! CIANI: Ajose, what do you think is the most important thing that you need to do Saturday night to be successful against Lucas Matthysse? OLUSEGUN: Keep fighting from all angles. That’s what I got to do. Keep fighting him from all angles, because this guy is really tough. I got to keep punching. That’s it. Keep working. CIANI: Now I know you don’t want to get too far ahead of yourself here and that you’re focused on this fight, but in the event that you’re successful and you win this fight, if you can pick and choose your next opponent would you have a preference? Would there be a dream match out there for you so to say? OLUSEGUN: Danny Garcia. He’s easy to beat. CIANI: What makes you think he’s easy to beat? OLUSEGUN: Danny Garcia? I think he’s easy to beat. He’s the weakest link. CIANI: Now do you have an official prediction for your upcoming fight this weekend? OLUSEGUN: Well I think the only way it’s going to end is I’m going to win, either by knockout or by points. I’m going to win. CIANI: Ajose, for my final question for you, is there anything else you’d like to say to all of the boxing fans out there and all of the readers of East Side Boxing? OLUSEGUN: Here I am. I’ve been waiting for this opportunity to show America and to show the whole world what I’ve got. Now I’ve got the opportunity and I’m going to show everyone what I’ve got. Saturday night make sure you tune in to Showtime and I’m going to perform—don’t blink because it’s going to be a terrific fight! CIANI: Great! Ajose, it was an absolute pleasure getting the opportunity to speak with you here today. I’m looking forward to watching your fight this weekend, and I wish you the very best of luck! OLUSEGUN: Thank you so much! The honor is mine.